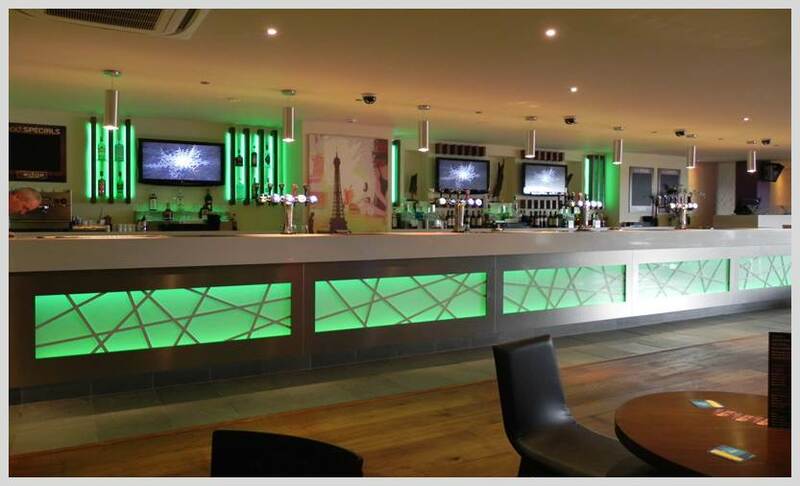 An extensive refurbishment of an existing bar was undertaken to provide a chameleon style bar that offers drinks/coffees, lunchtime menu and evenings for live music and DJ venue. The layout was of paramount importance to this scheme. It was essential that the irregular shape of the venue flowed yet created the zones for different elements of the trade.Oak flooring, stone bar tops and LED colour change lighting all adds to create a durable funky venue. A modern facelift ensured the venue catered for all from quality dining, to evening drinkers, including the local darts team ……. the dartboard is concealed behind canvas artwork during the day! !